With all the publicity about the Archaeoraptor fiasco (see Archaeoraptor Hoax Update—National Geographic Recants! ), some have recalled the 1986 claim by Sir Fred Hoyle and Dr Chandra Wickramasinghe that Archaeopteryx is a forgery.1 Archaeopteryx is one of the most famous of the alleged transitional forms promoted by evolutionists. This is probably why some anti-Darwinians are keen to dismiss it as a forgery. Both these expert scientists totally reject the charge of forgery. Dr Menton points out that the Archaeopteryx bones have tiny bumps where the feathers were attached to the bones by ligaments. This was unexpected, so impossible to attribute to a forgery. So it is simply wrong to say that the feathers are just imprints added to a dino skeleton. Also, Alan Fedducia, in his encyclopedic The Origin and Evolution of Birds,3 cites a number of reasons why Fred Hoyle is completely wrong. For example, limestone often contains dendritic (tree-like) patterns formed by precipitating manganese dioxide, and they are unique as are snowflakes. Some of them are on both the slab and counterslab containing the Solnhofen Archaeopteryx fossil, including some on top of the feather imprints. Alan Charig et al. found that when he backwardly printed a negative photograph of the counterslab dendrite patterns, they match perfectly with the corresponding dendrites of the main slab. Therefore the dendrites must have formed on the bedding plane before the slab was split. The skeletons had pneumatized vertebrae and pelvis. This indicates the presence of both a cervical and abdominal air sac, i.e. at least two of the five sacs present in modern birds. This in turn indicates that the unique avian lung design was already present in what most evolutionists claim is the earliest bird.4 An evolutionist trying to forge a dinosaur with feathers would not have thought to pneumatize allegedly reptilian bones. Rather, the evidence supports the creationist view that birds have always been birds. Analysis of the skull with computer tomography (CT) scanning shows that Archaeopteryx had a brain like a modern bird’s, three times the size of that of a dinosaur of equivalent size (although smaller than that of living birds). 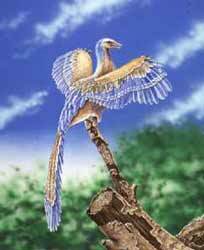 Archaeopteryx even had large optic lobes to process the visual input needed for flying. Furthermore, even the inner ear had a cochlea length and semicircular canal proportions were in the range of a modern flying bird’s. This implies that Archaeopteryx could hear in a similar way, and also had the sense of balance required for coordinating flight.5 Pterosaurs likewise had similar brain structures for flight—the large optic lobes, semicircular canals for balance, and huge floccular lobes, probably for coordination of the head, eye and neck allowing gaze-stabilization while flying.6 Once more, a forger adding feathers to a dino would not have thought to make an avian braincase, while it is yet another problem for evolutionists. Creation Ministries International will not stock any books that promote the Archaeopteryx hoax idea, at least not without a disclaimer, because it is the truth which shall set you free (cf. John 8:32), not error. Hoyle, F. and Wickramasinghe, C., Archaeopteryx, the primordial bird: a case of fossil forgery, Christopher Davies, London, 1986. Return to text. Feduccia, A.; cited in: V. Morell, Archaeopteryx: Early Bird Catches a Can of Worms, Science 259(5096):764–65, 5 February 1993. Return to text. Feduccia, A., The Origin and Evolution of Birds, Yale University Press, 2nd Ed., p. 39, 1999. Return to text. Alonso, P.D., Milner, A.C., Ketcham, R.A., Cokson, M.J and Rowe, T.B., The avian nature of the brain and inner ear of Archaeopteryx, Nature 430(7000):666–669, 5 August 2004; Witmer, L.M, Inside the oldest bird brain, perspective, same issue, pp. 619–620. Return to text. Witmer, L.M., Chatterjee, S., Franzosa, J. and Rowe, T., Nature 425(6961):950–953, 30 October 2003; Unwin, D.M., Smart-winged pterosaurs, perspective, same issue, pp. 910–911. Return to text.